Agriculture is a large consumer of hydrocarbon fuels and fertilizers. Conversions range around 20 calories to produce 1 calorie of food. The use of industrial fixed fertilizers has and will increase yields at a high energy cost. 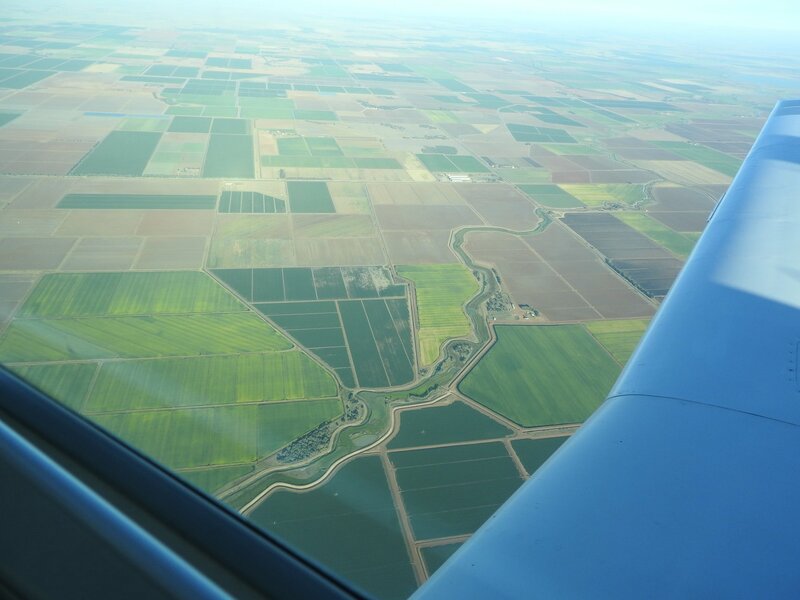 Over use of fertilizers that are high in ammonium or are made with chloride salts causes changes plant uptake: more anions and fewer cations are taken up by the plant. Over long periods of time this can influence a number of key plant physiological processes such as photosynthesis, and change the pH of the root exudates. Plant root exudates feed much of the soil microorganisms and the chemical composition of the exudates determines the species diversity of the root-associated microbial community. Changes in the species diversity of the microbial community can affect plant health, soil nutrient cycling and mineral nutrient uptake by the plant. Analysis of microbial cells shows that over 95% of the cell dry weight is made up of carbon, nitrogen, oxygen, hydrogen, phosphorus, sulphur, calcium, potassium. magnesium and iron. These elements are required in milligram quantities for the microbial growth. Trace elements (zinc, copper, molybdenum, cobalt, manganese, and nickel are required in microgram amounts. These elements are used to synthesize proteins, carbohydrates, lipids, nucleic acids, as cofactors in enzyme complexes, and other key physiological processes. The exhaust from engines has many of these elements in the oxidized form that is required for microbial growth. In the standardized Soil Equivalent Medium for isolating soil microorganisms there are only millimolar concentrations (eg 2.5 mM ammonium, and 2.5 mM nitrite) used to isolate and grow million of soil bacteria and fungi. These can be supplied from exposing the soil to conditioned engine exhaust. It is likely that adding conditioned exhaust to the soil stimulates the growth of soil microorganisms by providing essential elements such as nitrogen, calcium, phosphorus, and iron in the oxidized form. 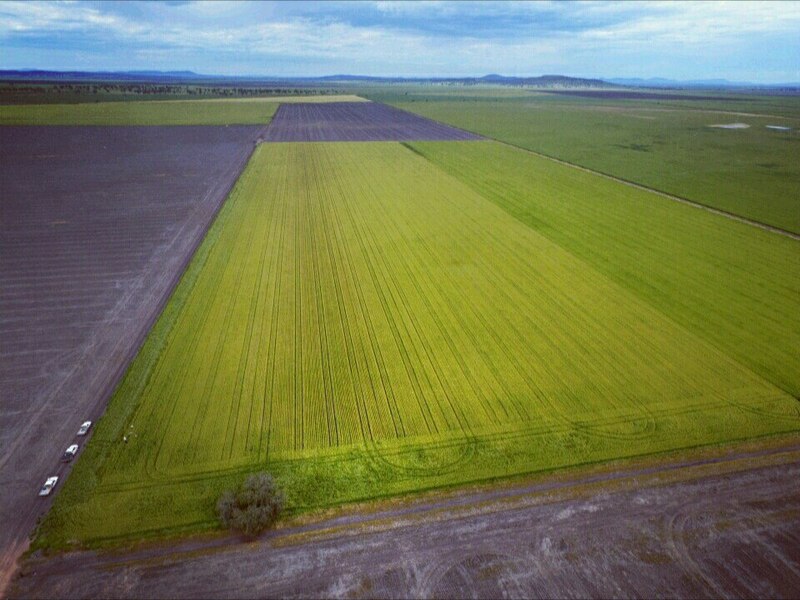 Stimulating the growth of the soil microorganisms could increase the nutrient cycling, increase populations of plant growth promoting rhizobacteria, and generally improve the biological fertility of 1o the soil, reducing the need for chemical fertilizer. 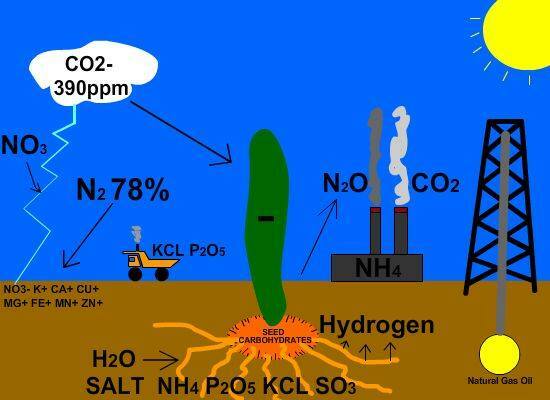 Micro-organisms use the oxidised compounds as building blocks to build proteins that become plant and microbial stimulants, enhanced interaction by the physiological shift by the influence of the conditioned emissions injection enhances the carbon cycle, and allowing the plant to store more sunlight energy and remove more C02 from the atmosphere throughout the growing season. This bioactivity is inhibited when large amounts of ammonium phosphate, nitrogen urea fertilizers are applied to the soil. Ammonium NH4 uptake by the roots causes the roots to use the HCO3 from photosynthesis changing the ammonia into urea before transporting nitrogen to the shoots. 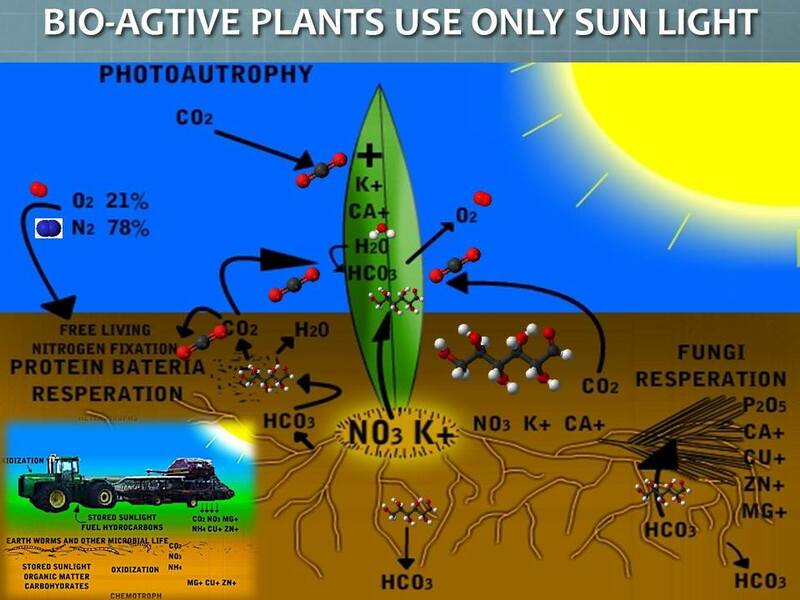 Excess hydrogen, leftover from ammonium and carbohydrates forming urea, is exchanged by the roots instead of HCO3 causing a lack of energy from the sun feeding bioactivity in the soil. Excess hydrogen protons makes the root zone acidic, causing problems with root growth and nutrient up take, less respiration of the soil causes compaction, and less mineralization and microbial life. 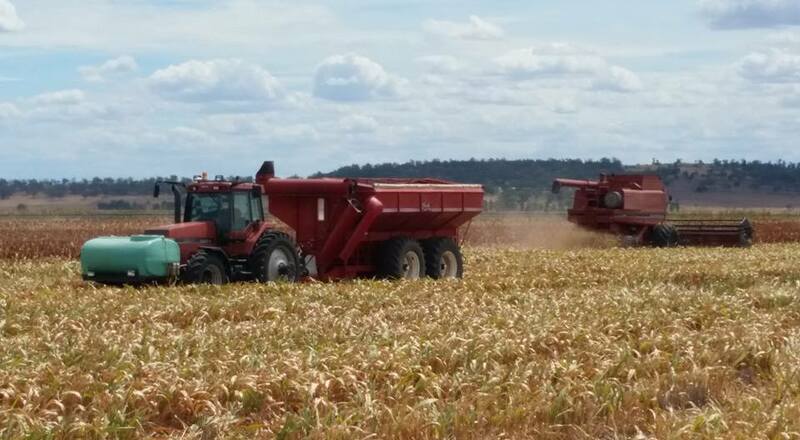 If you are using Fossil Fuel Energy to drive your Agriculture business, you are supporting the energy business.